The CHLS4 capacitive Hydrostatic Leveling System consists of a two-piece stainless steel housing, with a capacitive sensor embedded into the upper section. This measures the distance to the water surface from the top to the bottom. The water surface is in the lower part, the so-called water pot. The upper and the lower part are tightly screwed together in such a way that the water inlet and outlet is only possible via the water-conducting hoses that are fixed laterally. For the measurements, several systems are joined together via hoses. The water level in the »water pot« levels out after a certain time similar to the water level principle. The capacitive measuring principle is based on the principle of an ideal plate capacitor. As the measurement system not only depends on the distance between the plates but also reacts to the change of the dielectric in the measuring gap, the environment for capacitive sensors should normally be clean and dry in order to enable high precision measurements. 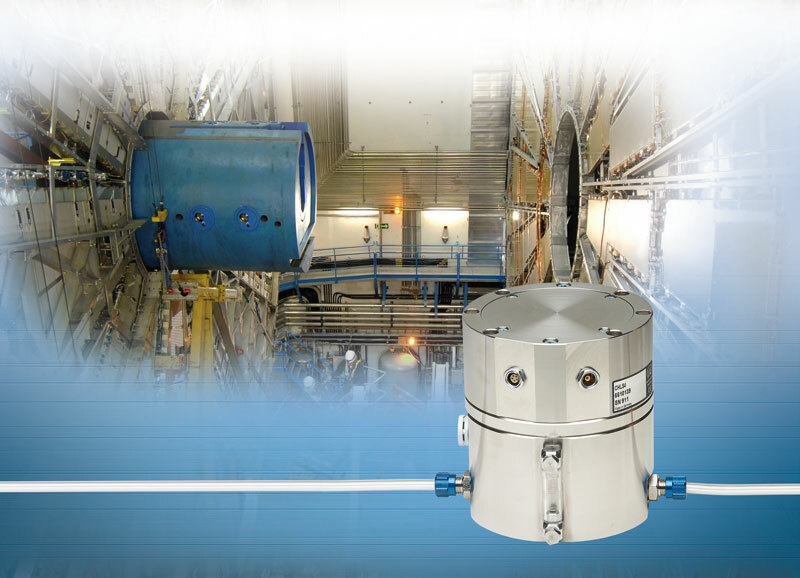 The challenge with this measurement task is therefore the environmental conditions, which are characterized by wetness and radioactive radiation in the case of the foundations of a particle accelerator. The protection housing of the CHLS4 in which the sensor is embedded is equipped with a flat, heated sensor element. This is always a few degrees warmer than its environment and therefore stays dry. The height of the water level can be monitored through the sensor element and a precise distance measurement against the water surface can be carried out. With experiments under radioactive radiation, only the sensor is mounted within the radiation area. The other components such as cable and controller are outside, which is why the system is easy to maintain. Probably the best-known particle accelerator is the CERN (Conseil Europeén pour la Recherche Nucléaire), the largest and most powerful particle accelerator in the world. The Conseil Europeén pour la Recherche Nucléaire is the European organization for nuclear research, whose center for physical basic research is one of the largest in the world. The tunnel in which the worldwide largest particle accelerator operates is 27 kilometres long and several hundred metres under the border between France and Switzerland. Such particle accelerators are predestined applications for the CHLS4 capacitive Hydrostatic Leveling System. Equipped with capacitive sensors, the CHLS4 ensures that the pipe through which the particles are sent is at same height, even when the concrete foundations of the pillars on which the pipes are mounted change their height due to natural soil movements. The altitude of the measuring stations in the kilometre-long pipe system therefore must be inspected continuously, while achieving an accuracy in the submicrometer range. This is the only way to ensure high functional safety and efficiency with the particle collision. The concrete pillars have been constructed at a distance of about six to eight metres. The CHLS4 is at their base, with one sensor per concrete base respectively. These sensors are interconnected with a hose system. Similar to the conventional water level principle, a change in height is precisely detected via the water level.